The large catchment area, combined with the relative flatness of the Wey Valley, has left Guildford prone to flooding. Nowadays, we regard flooding only as a problem. But in the past it was essential. The silt from the floods maintained the fertility of the meadows, but floods were unpredictable and uncontrolled. Sir Richard Weston was born in 1591 at Sutton Place. He was educated in Flanders and between 1618 and 1620 he used techniques that he had learned in Holland, to deliberately flood the meadows. This kept the ground free of frost and increased the harvest of hay, often allowing a double harvest. 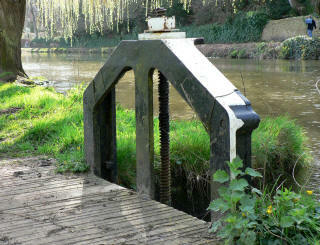 He constructed Stoke lock, the first on the River Wey and dug a 5 km long channel, which he called the “Flowing River”. Sluices were used to produce controlled flooding of the meadows. This technique boosted the agricultural wealth of Guildford and quickly spread all over England. Unplanned flooding is still a problem and various attempts have been made to control the river. In 1900 the medieval town bridge was swept away by a flood. In the 1930’s, there was a major flood prevention project with sluices, weirs and drainage channels which are still in use. However the floods of 1968 and 2000 prove that the river is not fully tamed.